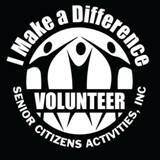 Volunteers - Senior Citizens​Activities, Inc.
﻿Looking for an exciting environment to be a part of? Come give back to the community at Senior Citizens Activities, Inc. in West Bend, WI. Contact us to learn more about our intriguing volunteer opportunities at Phone #262-335-4498. You don't have to be a Senior to Volunteer. 4 hrs long (8 am - noon, noon - 4 pm). Some computer work is necessary, but don't worry, we will train you. Travel Planner - Senior Citizens Activities is in need of a Volunteer Travel Planner. Various hours to schedule one-day trips for seniors, handle details, confirmation letters and assist on the day of the trip in getting seniors on the motor coach. Volunteer Drivers are needed both to bring Senior Center participants to the Center as well as to assist others in the community. Senior Citizens Activities, Inc. and Interfaith Caregivers support one another. Want to help an elderly neighbor? Be a volunteer driver for Interfaith! They have folks in every community that need a little extra help getting to places they need to go, ​doctor appointments, grocery store, pharmacy, the Senior Center and more! It’s flexible – your help for even 1 hour a week can make a big difference! Drive your own car or one of Interfaith’s vans.